The Residhome Neuilly Bords de Marne serviced residence offers ready-to-live-in apartments and personalized hotel services in a warm and elegant setting. 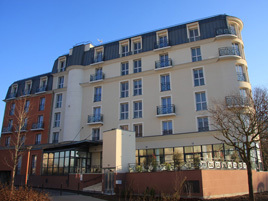 Situated on the outskirts of Paris, on the RER A train line, the residence is situated near the Gare de Lyon, Châteletles-Halles and Disneyland Paris©. Make these riverside apartments the accommodation of choice for your business trips and leisure breaks away. Open 24 hours a day, the serviced residence is made up of 65 studios, including a living room, a fully-equipped kitchen (microwave, fridge, glass-ceramic cooktop), a bathroom, an office area, and an LCD TV with digital channels. You will appreciate the complimentary amenities and services available to you such as internet access (Wi-Fi connection). Many additional services, available for an extra charge, will make your stay a smooth one: breakfast, laundry facilities, parking, mini market, etc.